BBC's new dinosaur series Planet Dinosaur was launched this week with the tale of the Spinosaurus a carnivorous dinosaur maybe even bigger than the king of the lizards the Tyrnnosaurus Rex. Like Wikipedia I qualify it with maybe because the world of Paleontology is a puzzle where you have to reproduce never seen before creatures from incomplete skeletons using what we know about modern creature's anatomy as a guide (the BBC did a piece on their website about how you do it here). The Spinosaurus remains were uncovered in Egypt in 1912 but destroyed when the British bombed Munich in 1944. However based on drawings and descriptions of this specimen along with several others finds in 2005/2007 estimates were published claiming it was indeed bigger than T-Rex. I don't know who I feel more sorry for the T-Rex or all the other dinosaurs who didn't get to headline this new series because they were not big enough or too ordinary. Scientists are all too willing to discard popular terms in the name of scientific purity such as kicking Pluto out to be just a dwarf, and dumping the catchier Brontosaurus in favour of Apatosaurus but surely we can't demote T-Rex a pillar of popular culture. T-Rex is everywhere from Rex in Toy Story to plastic giants in our local crazy golf. Perhaps the documentary writers would have preferred T-Rex and Spinosaurus to face off in a death match for the title of King Of The Lizards but instead they had Spinosaurus fight a Carcharodontosaurus (thats easy to say). 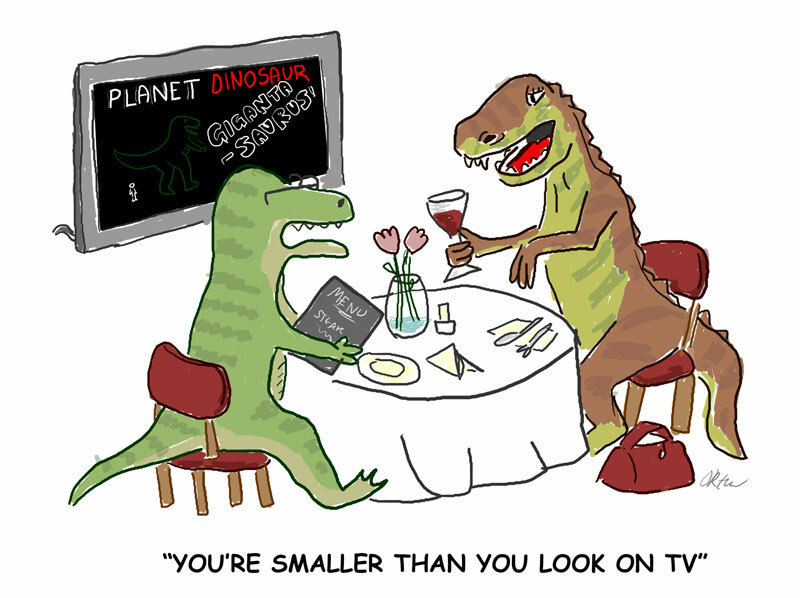 None of which explains the cartoon except to say I like the marketing term 'Gigantasaurus' for a big dinosaur and wonder if real Dinosaurs ever watched Planet Dinosaur would they be able to recognise themselves. The entire point of Planet Dinosaur was to showcase how much we have learned about dinosaurs beyond the old clicheed great fossil lizards, like 'Brontosaurus' or Tyrannosaurus, instead picturing dinosaurs in their current light, as a group of unique, diverse creatures that had an extraordinary impact on our world today. Our knowledge about dinosaurs is constantly changing and yet we have come a long way since a decade ago; inaccuracies may still be abound, but new discoveries each day are shaping how we percieve them. That's what science is. Documentaries are not showcases of pop cultute, they're showcases of brilliant science. Plus, who wants to see Rexy over and over and over again? It's boring. And one last thing, documentaries are not supposed to show random deathmatches. Tyrannosaurus and Spinosaurus were separated by distance in time and space. Jurassic Park III much? Thanks for your comment Lythronax argeses. In some ways cartoonists like myself are just showcases of popular comment drawing and commenting on whatever tickles our fancy and is in the spotlight. So it was interesting to read the thoughts of someone who actually works in the realms of Paleontology rather than my opinions from someone who thinks dinosaurs are cool and reads Wikipedia articles on them. While I agree with what you say about avoiding old cliched dinosaurs and showcasing new discoveries from what I know about how documentaries and TV are commissioned (second hand from people who work in TV) I would say there is often the pressure to find an angle to make them more entertaining. That said I'm all for documentaries that are showcases of brilliant science.